A recent travel ban issued by President Donald Trump means that an international Christian university in Pyongyang is no longer seeking American volunteers, a recruitment notice seen by NK News on Tuesday reads. The ban, which Pyongyang University of Science and Technology (PUST) says now affects up to half of their faculty, prohibits U.S. citizens from visiting the DPRK. The notice, send as part of a call for volunteers, suggests that hopes in some quarters that Washington might be flexible about exempting PUST’s volunteers from the recent North Korea travel ban now appear to have been dashed. “So-called ‘Trump Ban’ has prohibited our American colleagues, accounting for some 1/2 of total foreign faculty, from traveling to the DPRK, regardless of the purpose of the trip,” the school’s Acting Dean of International Finance and Management (IFM) Department Paul Song said. PUST is now recruiting volunteers and professors from Asia and Europe to make up for the loss of American staff, asking for volunteers from these regions to begin teaching next spring. The travel ban has exacerbated many of the university’s long-term problems, Song said. “Needless to say, our chronic faculty shortage and curriculum instability have been exacerbated even further, translating into the emergency situation of crippled school operation and curriculum running,” he added. On September 4, PUST kicked off its fall term without any American staff. July saw the Trump administration announce that U.S. citizens would no longer be allowed to the DPRK, a move seen as a response to the sudden death of Otto Warmbier upon his return from captivity in the DPRK. But the ban has called into question the future of PUST, which was founded by and is now part-run by Korean-Americans, in a year when the school has seen the detention of two of its volunteers by DPRK authorities. 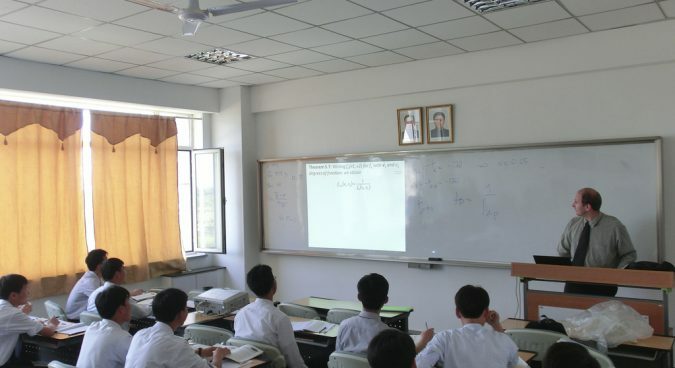 Tony Kim, a professor at the PUST-linked Yanbian University Science and Technology in China, was detained on his way back to China from teaching in Pyongyang in April and was later alleged to have “aimed to overturn the DPRK”, though no details were given about the specifics of his actions. PUST, a private university funded largely by Christian churches across the world, has been accepting American volunteers since 2009. Students are largely plucked from North Korea’s elite class.